Timing is really important. Really important. My regular readers and students know that I’m always talking about timing. If a song doesn’t have a consistent beat, there is no groove. No groove means nobody can tap their foot. Have you ever been totally into a song on the stereo when the CD skipped? For the instant before you register what happened it feels like the end of the world. Imagine when that groove isn’t even there to begin with… That’s why you work on timing. Almost every song has a pulse. A steady, driving force that exists whether you hear it or not (whether or not it is played) and pushes the song along in time. This timing force is called the beat. The beat is the most basic rhythmic aspect of a song. It repeats at consistent intervals over and over. Wherever you tap your foot or clap your hands in a song is where the beat usually lives. A beat happens independently of everything else in the song. Sometimes, notes, chords, hits, words, or flying pigs land on the beat (at the same time as the beat). Sometimes they don’t. The beat continues no matter what. This is a real-world example from my song Aerial (off of Point A) with the metronome cranked way up. It’s a different tempo and sound than the other examples, but hopefully you can hear how all the instruments are playing something different, while staying with the beat even if they aren’t necessarily on it. The keeper of the beat is a metronome. It plays a steady click on the beat. It never strays. As long as you have it turned on it will go forever. It doesn’t care if dinner is ready, if the phone rings, or if meteor conks you in the head. It is your best friend and harshest critic. Get one. I highly recommend the Pro Metronome app for iOS devices. It’s free and does much more than most of us will ever need. 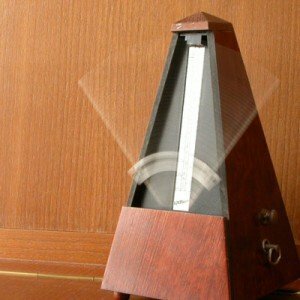 Or, if you are practicing near a computer you can use the simple metronome at Metronome Online. A “beat” can also refer to a drum beat. As in, “Dude, that’s a fat beat!” That kind of beat is a repeating pattern the drummer plays. It’s different than the “keeping time” beat, but always follows it somehow. The amount of time it takes to get from one beat to the next is the tempo of the song – how fast or slow it goes. Tempo is counted in beats per minute. The more beats, the faster it goes and vice-versa. For some reference: 40 BPM (beats per minute) is really slow, 120 BPM is kind of the middle ground and 200 BPM is really fast. All colors of the tempo rainbow live between and beyond. You’d be surprised how much difference in the feel of song a couple BPM makes. The note tells you that one beat = a quarter note (1/4 measure). The number is how many BPM that note equals. If you were to use an eighth note there, for instance, to match the same tempo the number would be double: 240 BPM. Play around with different tempos on your metronome. They are all useful and you should at least get an idea what many of them sound like. Music repeats a lot. Most of all when it comes to keeping the beat. Since it’s so repetitive, actually counting the beats can be pretty boring. That’s not to say it isn’t important! Knowing where you are at in the beat is the difference between confidence and guessing. When you count a song you give number names to each beat. This helps you know what beat certain notes, chords, or words fall on or around. The number pattern repeats depending on what time signature you are in. For now we’ll just talk about the 4/4 time signature (more on that below) that everyone is so used to hearing. In 4/4 you count in fours: 1… 2… 3… 4… 1… 2… 3… 4… on and on until you reach the end of the song. Those aren’t random numbers. They each have a specific home in a measure. The X-ed-out note just means that it has no pitch (like a drum or banging on your desk) and the stem tells you it is a quarter note (1/4 of a measure). Try listening to or playing a song you know well and begin counting where you feel the beat. It takes practice to be able to continue playing and put your mind on autopilot to count. Say it out loud. Otherwise you run the risk of getting trapped in the ego of the mind that compensates for poor timing. Another thing to get into the habit of doing is tapping your foot. Revisit all of your old songs and practice them until you can tap your foot on the beat the whole way through. If you can’t after some practice, keep practicing. It’s really important. Time signatures are yet another part of the puzzle. We’ve talked about beats and tempo, but how do you know how many beats goes into each bar before you start at 1 again? That’s what a time signature tells you. A time signature is made up of two numbers representing two things. The first – and top – number tells you how many beats are in a measure. The second – and bottom – number tells the duration of that beat. So in the most common time signature – 4/4 (said “four, four”) – the first number tells you that there are 4 beats (counts) in each measure. The second number tells you that you are going to be counting quarter notes (a 4th of the measure is a quarter note). You could play in 8/8 time and it would take the same space as 4/4 since you need twice as many eighth notes to fill the measure. This is by far the most common time signature for ‘ukulele music. Probably 95% of mainstream songs are in 4/4 time. It’s super easy to play in. Just count “1… 2… 3… 4… 1… 2… 3… 4…” and you are thinking in 4/4. You will also hear this time signature called “common time”. Common time (just think of it as 4/4) is shown in the staff as a big “C”. The 3/4 signature is considered “waltz time”. If you listen to a waltz song or some other piece using 3/4, you will notice that instead of four beats per bar, there are only three (1… 2… 3…). Because of the odd number of beats 3/4 often uses a rhythmic feel of low, high, high – “low” being the 1st beat. My personal favorite, 6/8 time is essentially doubled 3/4, but with more of a rolling feel since the pattern takes twice as long to repeat. The strong beats of 6/8 are the 1 and 4. So if you count it, put a little more emphasis on those: 1… 2… 3… 4… 5… 6… Try it! Doesn’t it feel good? Now we’re getting really weird, but this deserves to be included. 7/4 is a cool recycling sound because you expect an eighth beat, but instead you get the 1! This is a popular time signature for metal bands since it’s sufficiently “weird” and has an unsteady feel. Add an extra beat to 4/4 and you get a super challenging time signature called 5/4. The main trick to counting an odd time signature is to find the feel. Once you know how it “feels” you can forget about counting it explicitly. One way to make this easier is to find a smaller sub-count you can create that follows the pulse of the song. For example, to count 7/8 you could use 3+4, 4+3, 2+2+3, etc… Another method is to find where the measure starts and compare it to what you’re normally used to in terms of recycling to 1 earlier or later. For instance, I don’t need to count 7/8 anymore because I’ve learned to feel it as recycling one beat earlier than normal.